What was Nathan Drake up to before the events of the first Uncharted? Find out in the Uncharted prequel motion comic. Naughty Dog has just released the first of four planned episodes in its Uncharted prequel motion comic on the PlayStation Network. The idea behind the comic is to give more depth to the character of Nathan Drake and to show that his life did not begin on a boat with Elena at the beginning of Uncharted: Drake's Fortune. A "motion comic" is basically like a comic book but with some motion and voice added. 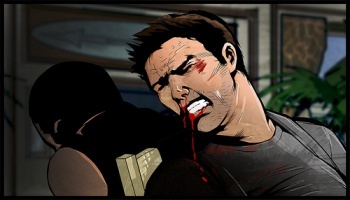 Actors read the lines that appear in word bubbles on the screen, and various parts of the comic move, such as fists into Drake's face and blood out of his mouth. The official title for the motion comic is Uncharted: Eye of Indra, and it features the same voice actors from Uncharted and Uncharted 2. The general storyline involves the three treasures of Indra, but it's not worth ruining much more; just go and download the first episode for free and watch it. It's around 7 minutes long, interspersed with some very short ads, one of which is a little silly. Later episodes will supposedly come with a cost, but Naughty Dog has hinted that something special will be included as a pack-in with each episode. With two blockbuster hits under his belt, and now a prequel investigating his past, Nathan Drake is easily a contender for this generation's Indiana Jones. His first movie is even already in the works.